Husband and wife James and Maggie Skinner of Stamford Striders enjoyed a family double at Fineshade Woods on Sunday, as they both celebrated victories in the Remembrance Day 11k. A late change to the course, due to forestry work on the planned circuit, meant that the race length was approximately half a kilometre under the billed distance, but the hilly and slippery nature of the course ensured that the near 400 runners were not given an easy ride. Runners from the Peterborough and Stamford area dominated proceedings with James Skinner winning the men’s race in an impressive time of 38.37, with his wife finishing first lady with a 42.36 clocking. Steve Hall (44) of Peterborough AC is currently enjoying a rich vein of form and added to his recent medal-winning run in the Fenland 10 by taking second place just ahead of Nene Valley’s Lee Harthill. 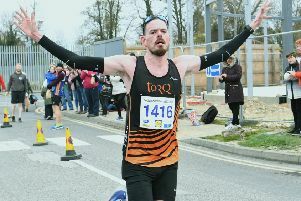 Stamford Striders Mark Popple and Gareth Williams secured fourth and eighth positions respectively, while James McDonald of Nene Valley came home in fifth position. Eye Runner Sarah Overington is another athlete enjoying a purple patch and she was rewarded for a fine effort when finishing runner-up in the ladies race in 45.17. Saya Sheridan of Rutland Running and Triathlon club was third with Nene Valley veteran Yvonne Scarrott fourth and first female vet Over 45. Men’s age group prizes were won by PACTRAC’s Robin Brookes, Eye’s Roy Young, Brian Kearney of Stamford Striders and the evergreen 71 year-old Eye ace Terry Fone, while Stamford’s Suzanne Moon was the first Over 35 lady. Ellie Piccaver (15) of Nene Valley was the first girl home in the junior 3k race, finishing in fourth place overall in a time of 12.45. Jasmine Heron of host club Eye had an outstanding run finishing fifth girl at the age of just nine. The event raised over £3,0000 for The Royal British Legion.